My kindergartener loves leaves, especially fall leaves. 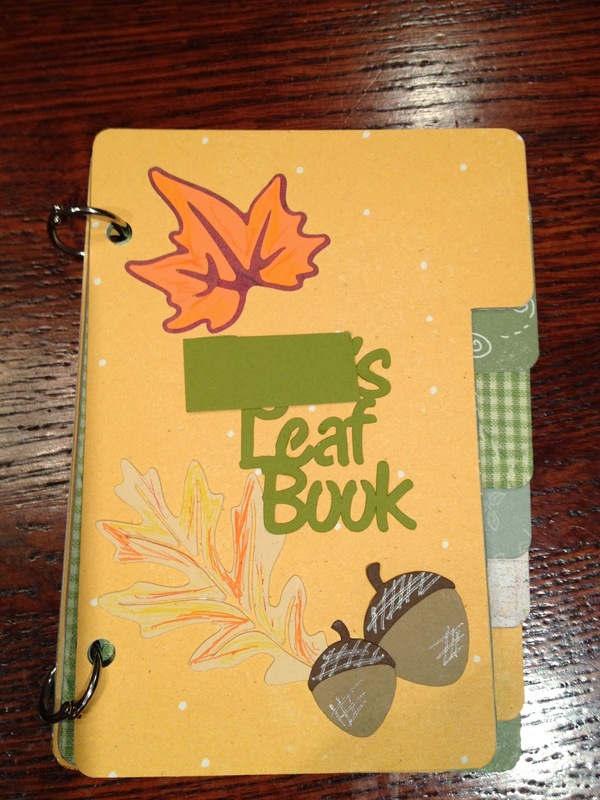 We have made several leaf books over the years holding her precious collections. This year she is even studying leaves in school. So of course she wants another book to hold her latest collection. 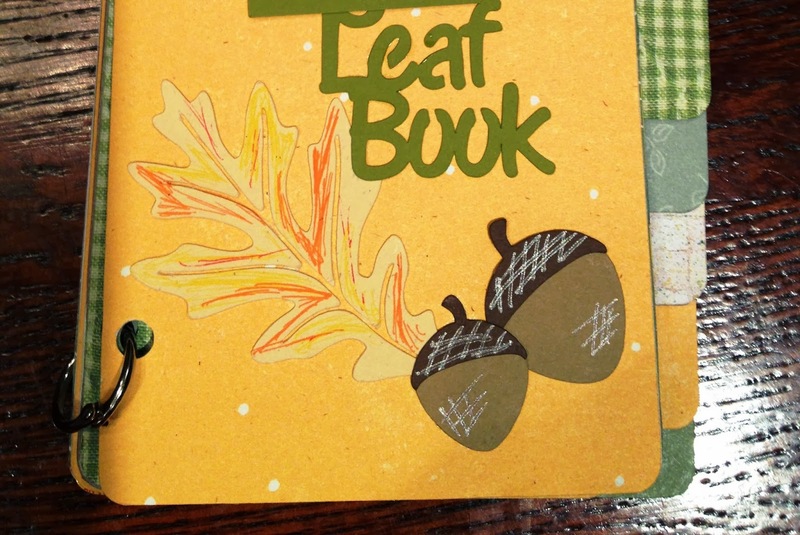 We haven't gathered the leaves yet because it has been raining so much but I did get her leaf collection book done. I purposely blocked out her name in the photo above but you get the idea. I made this book with my latest toy, a silhouette cameo die cut machine. Oh I love this machine. But I think you could easily make this book without it. I used tabbed recipe cards which I cut out of cereal boxes (free chip board) as pages. I covered both sides of each page with scrapbook paper cut to the same size. The recipe cards are of course turned on their sides for the book pages. I made them 6 inches high and a little over 3.5 inches wide. I decorated the front cover with various leaf shapes and letters. I added some extra detail and depth with colored pens. Then I punched two holes in each page (using the first page hole punched as a template). I could have cut the holes with my silhouette but didn't think about it until later. Last was to put the whole thing together with 1/2" binder rings. Next we will gather some leaves, add some embellishments, notes, and labels. Super simple. Love this idea! I think my granddaughter would enjoy something like this. She is 3 and when we take walks she likes to pick up the different colored leaves. I'm going to pin this for my daughter and maybe I'll put the book together for them. My daughter just loved it! We now have leaves pressing in books. I think I may try to modge podge the leaves into the book. Thanks for stopping by. What a cute idea! My name is Katie and I host Fall Into the Holidays, open Saturdays! I'd love to have you link up! So cute! I'm sure your daughter will have fun adding her leafy treasures to the book. Thanks for sharing this craft at Motivation Monday. I love this! When my boys were little we made similar books. Except we didn't put the actual leaf in the book, we did crayon rubbings of the leaf! In fact, my middle son entered his book in the school science fair and won a prize! Vickie I love that idea! We are so going to have a rubbing or two in the book. Thanks for the great idea. My daughter thinks I am so creative. Hopefully she will never find out that I really don't have a lot of original ideas but just know really creative people. Thanks for stopping by Nellie. My daughter always reminds us that "God made this!" Which always makes me smile. Very nice leaf book! Years ago I helped my daughter make a wildflower folder, when she was studies wildflowers. The teachers had the students put them in folders. That was fun collecting, and drying. We then laminated them. I still have it somewhere. I should make a leaf or wildflower book with my granddaughter, I bet she would love that. Thanks for sharing your lovely book, and bringing back the fun memories. Pinning! 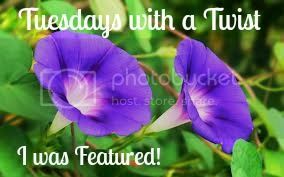 This wonderful post has been featured on "Tuesday with a Twist" blog hop! - If you get a chance - pop by my blog & pick up a "featured" button. How cool! Thanks for sharing this at the HomeAcre Hop! We'd love to have you back again ~ hop is live this morning. I love this idea! My daughter loves little books and will enjoy making this one as well!